Heat the milk in an appropriate sized pot. Be careful not to scald. Add the vinegar and stir. You can also use 4 teaspoons of lemon juice, or as a nice alternative, orange juice, which will make a slightly sweeter curd for use in home made cheesecakes. 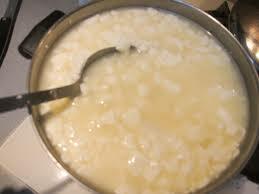 If the curds don’t seem to be forming, add an extra teaspoon or two of your chosen citrus juice. I’m not so sure it was the spider that scared her. I always wondered if the spider was doing Miss Muffet a favor by scaring her away form the curds and whey.